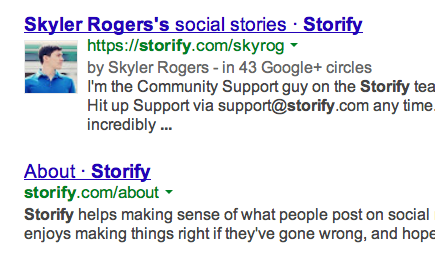 Storify, the service that lets you create stories by collating tweets and other online content, has added two useful features to allow users to add Google+ authorship to their Storify content, and post stories to a Facebook Page. A post on the Storify blog explains how users can calibrate their account to include authorship, which adds a thumbnail and details of their Google+ profile to Google’s search results page. Likewise, a step-by-step guide explains how to link a Facebook Page, which is an option that is open to all Storify Business customers. As well as sharing content to their Page — which will override the setting for sharing to a personal Facebook account Timeline — Storify Business users can add a link to their Page to their Storify account to help cross promote the two channels.